South Africa houses a vast variety of bird life with in excess of 800 species (850+-), around 50 of these species are endemic or near endemic. Due to the various other forms of wild life in the country, South Africa sees a lot of nature enthusiasts from around the world visiting with the sole intent of seeing and enjoying some of the local wild life, and in many cases birds are one of the primary targets for these visitors. One of the reasons for the large number of bird species is the variety of habitat that can be found around the country. The northern parts of the country have summer rainfall and on the north east coast the sub-tropical environment of Kwazulu-Natal offers some of the more striking coloured birds with the Purple Crested Turaco being one of these. A number of raptors can also only be found in the northern and north-eastern parts of the country. The central areas, such as the Karoo will give way to many LBJs and raptors, this is an area where open, dry, small brush and isolated trees is the setting. Down in the Western Cape the birding target is usually the pelagic offerings just off Cape Point, which can rack up impressive lists of sea bird species, especially in the winter. The number of mountain ranges also allow Eagles and Vultures to be found, the latter being primarily found in the Drakensberg. 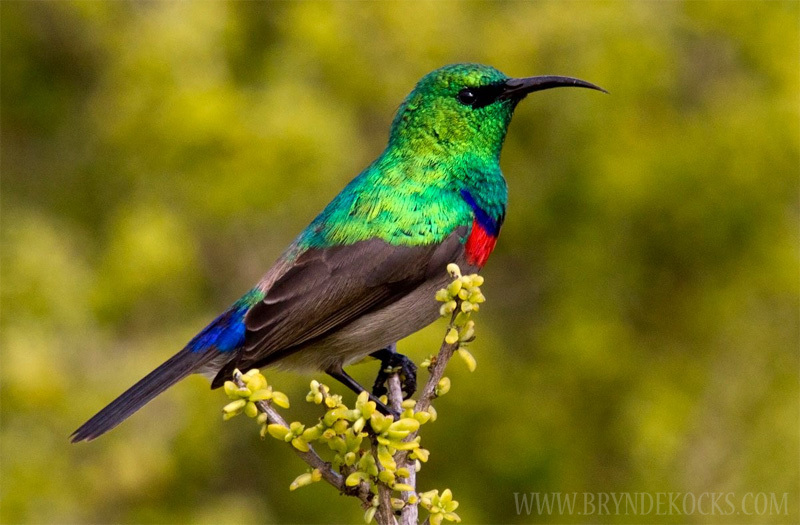 One of the most memorable near-endemic groups of species are the Sunbirds that can be found. These small, bright little birds are often compared to the Hummingbird, both are small nectar feeders often with iridescent colours. For birding locations in South Africa use the menu and select your desired locations under the “Birding” tab.